MINERVA — Minerva scored three runs in the third inning to beat Salem, 4-2, Tuesday. Salem’s Hayden Carner hit a ball off the left field fence for a double, but a Minerva relay cut down the runner at the plate to preserve the victory. Stella Bodizar tripled for Minerva and Elyssa Imler doubled twice. Bailee Thorn doubled, singled and scored both of Salem’s runs. Salem’s Taylor Thorpe went the distance while giving up one earned run and striking out 14, stretching her double-digit strikeout streak to five games. Salem is at Marlington on Thursday. M–Olivia Kamph, wp (7IP, 2ER 2K, 0BB) and Alex Street. S–Taylor Thorpe, lp (7IP, 1ER, 14K) and Hayden Carner. WINDHAM — Lisbon’s cleanup hitter cleaned up Tuesday. 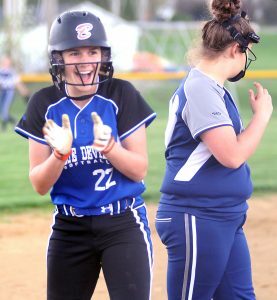 Mya Emmerling drove in six runs with a home run, triple and double at the Blue Devils pounded Windham, 22-3, in five innings Tuesday. The Blue Devils, who improve to 7-0, collected 23 hits with nine going for extra bases. Everyone got into the act for the Blue Devils. Autumn Oehlstrom had four hits, including a triple, four RBIs and scored four runs; Justyce Vrable had two triples, a double, drove in two runs and scored four runs; Mallory Gallo had three hits, including a double, three RBIs and two runs; McKenna Dailey three hits, two RBIs and two runs; Emma Thompson had a double, two singles and two runs; Natalie Ammon had two doubles, two RBIs and two runs.Kenedy Vrable had two hits and two RBIs. Taylor Deland did her part on the mound, scattering five hits for the victory. The Blue Devils blew open a 3-1 game with 10 runs in the third inning and nine more in the fourth. Lisbon will play at Columbiana at 5 p.m. today. L–Taylor Deland, wp (5IP, 3ER, 4K, 1BB) and Katy Clark. W–Venstenberry,lp (5IP, 12ER, 3K, 3BB) and Showalter. UNITY–East Palestine moved its record to the .500 mark with a 5-1 win over Toronto on Tuesday. Delaney Early had two hits for the Bulldogs (4-4, 4-3 in the Eastern Ohio Athletic Conference). Joclyn Fristik added an RBI triple. Kenzee Johnston had two hits and two RBIs, while Morgan Rutledge had two hits and an RBI. Springfield Local is at East Palestine on Thursday. T–Anderson, lp (4IP, 2K, 1BB), Kinsey (2IP, 1BB) and Reed. MCDONALD — Bri Callow struck out 16 and held Sebring to two hits in 10-0 win in six innings Tuesday. Alexa Rockwell went the distance for Sebring, striking out three. BELOIT — Canton South handed West Branch its first league loss with a 9-8 win over the Warriors on Tuesday. West Branch was down 9-1in the sixth inning and rallied for seven runs, but it wasn’t enough. West Branch is 8-2 and 4-1 in the Eastern Buckeye Conference, while Canton South is 3-1 in the league. Jordan Anderson had a single, triple and three RBIs. Peyton Alazaus had two doubles and two RBIs. Grace Heath added two hits. West Branch is at Jefferson Area on Wednesday. CS–Ashley Zwick, wp (7K, 3BB) and Taylor Tydings. WB–Jordan Anderson, lp (8K, 3BB) and Sam Morris. COLUMBIANA — Crestview notched its 12th win of the season by downing Beaver Local, 9-2, Tuesday. Haley Eskra led the Rebles with three hits, a walk and three runs. Olivia Strank, Kaedyn Sutton and Skyler Mattern each had two hits and two RBIs. Shianna Mathes added two singles. Alexis Jordan and Tori Bowersock had RBI singles for the Beavers. Crestview (12-2) will play at Campbell Memorial today, while Beaver (4-5) hosts East Liverpool today. C–Kadeyn Sutton, wp (7IP, 8K, 3BB). B–Olivia Keller, lp (5IP, 6K), Cierra Thurik (1IP, 1K) and Tori Bowersock. HANOVERTON — Leetonia won its first Eastern Ohio Athletic Conference softball game by dropping United 14-4 in five innings on Tuesday. Megan Rosko had two three-run homers for the winners. HUBBARD — South Range bashed out 18 hits in a 11-2 drubbing of Hubbard on Tuesday in Northeast 8 play. Marlaina Slabach had three hits for the Raiders (6-3, 4-2). Bree Kohler had two triples and a single. Jillian Strecansky had a triple, double and single. Julie Centofanti had three singles and Drew Feren had two singles. H–Grace Markum, lp (11K) and Hannah Kist. BERLIN CENTER — Alyssa Serensky had a single, triple and four RBIs as Western Reserve beat Jackson-Milton 12-5 on Tuesday. Jasmine Phillips added a single, double and two RBIs. Western Reserve is 4-4 and 3-2.